How to build your own External USB hard drive. Having recently installed Kubuntu, and on a different machine, PCLinuxOS, one of my priorities was to get my printers working. This proved very easy with my Samsung ML4500 Laser printer, which was recognized by the KDE Printer wizard, but problematic for my Epson R200, for which the necessary drivers were not included in the distribution. 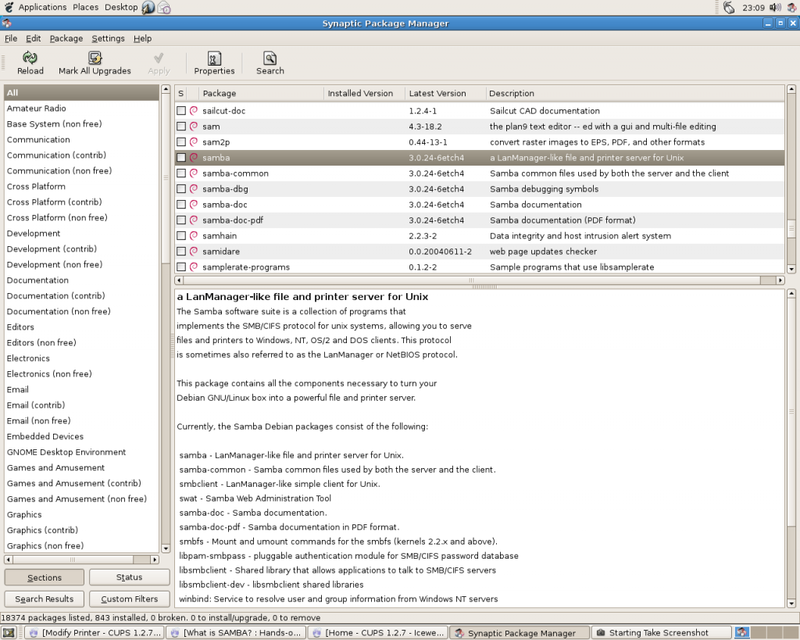 “NEW:” Debian has now been added – see Part 3. Also, there is now a small troubleshooting section at the end. However; fear not! There are comparatively easy ways to overcome the problems and all will be revealed. Parts 1 and 2 should be followed for Kubuntu, but only Part2 for PCLinuxOS, as the drivers are already available in the system. Please read Part 3 first for Debian, as it is an addition to this page, but “does not” follow the logical sequence of the other two. Note: I have written a completely new tutorial for Debian Squeeze, available here. 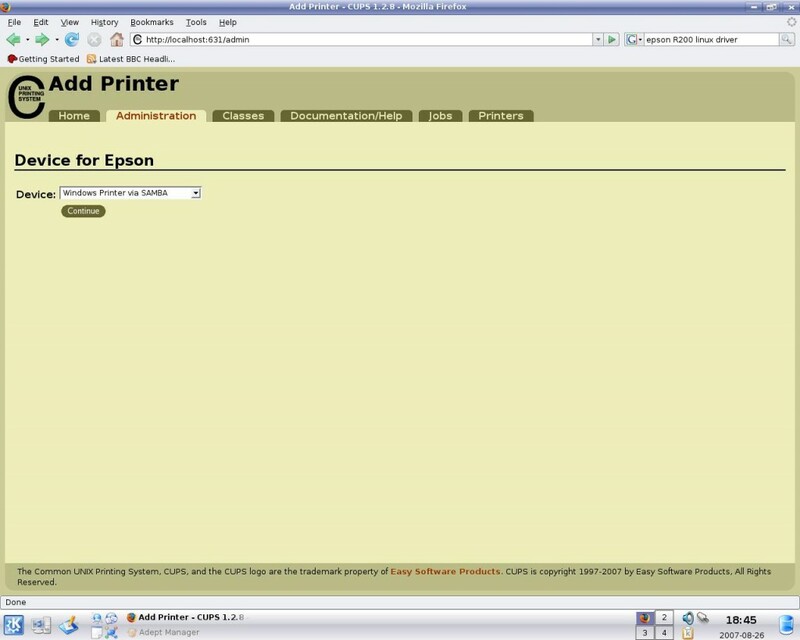 Research on the Internet revealed, the GIMP has a plugin which not only supports many Epson printers, but dozens of others as well. So to get right down to the procedure, just follow the following and all should be well. First, you need to install the Gimp plugin. Now, I don’t know whether you can just use the plugin or not, but as I wanted to install the GIMP anyway, I chose to install the whole caboodle. If you’re command line fanatic, feel free to use apt-get, but for ease of new users, I have used the Adept Package Manager included with the default installation of Kubuntu. Go to the K icon at the bottom left of your desktop and select System, Adept Manager and click to launch. You will get a box asking for your password, and then Adept will open. Scroll down the main panel until you reach gimp. Expand gimp by clicking on the > and you will get an option to Request Install. You will also need gimp-print as a minimum, so again, expand and request install. Once you have selected your required packages, go to the top of the screen and click Apply Changes and Adept will work its magic! I’ve got a screen shot so that you can see what I installed for my purposes. Once this is done, you have the drivers available for your Epson R200 printer. The question now is, How do I install them? Well, there’s this really cool application called CUPS. 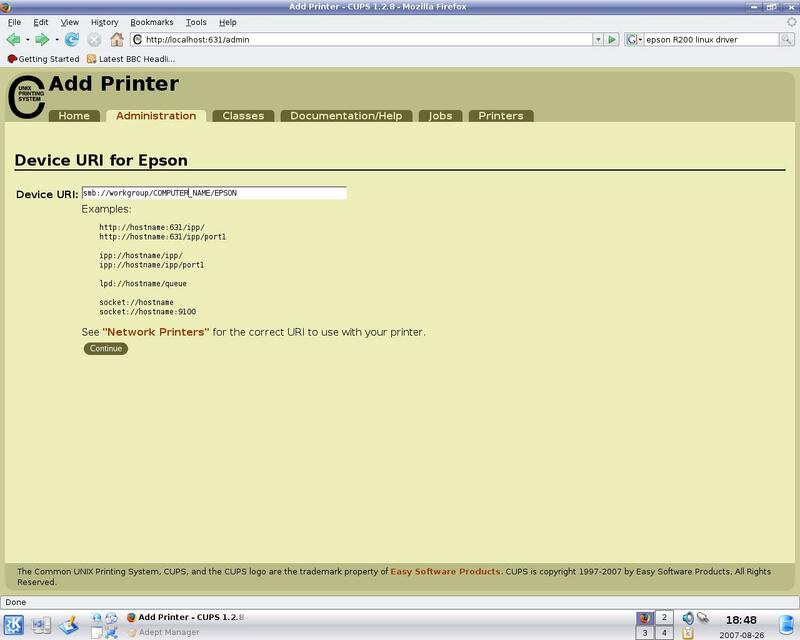 CUPS is the Common Unix Printing System and it is installed by default on your Kubuntu system. In order to access it’s powerful features, open your favourite web browser and in the address bar type: localhost:631 just like this. Hey! Just relax, you’ve done all the hard work now, the rest is so easy, you wont believe it. On the above page, click on Add Printer and the next page will open. Fill in your own appropriate details and click Continue. Now, you will get a screen asking Device for any. This is simply asking you how the printer connects to the system. A word of explanation may be in order here to explain the screen shot. My Epson printer is connected to a Windows box and I wanted to connect via the network. Therefore, I chose Windows Printer via SAMBA. Yours may be different. Whatever you choose will determine which page you get next. For example, if your printer is connected directly to your computer, you may not get the next page I’m about to show you. You will probably go straight to the Make/Manufacturers page. Anyway, staying with the original track, as it is a network printer, CUPS needs a path in order to send the print files. So the next page you get is called Device URI for any (Uniform Resource Identifier). 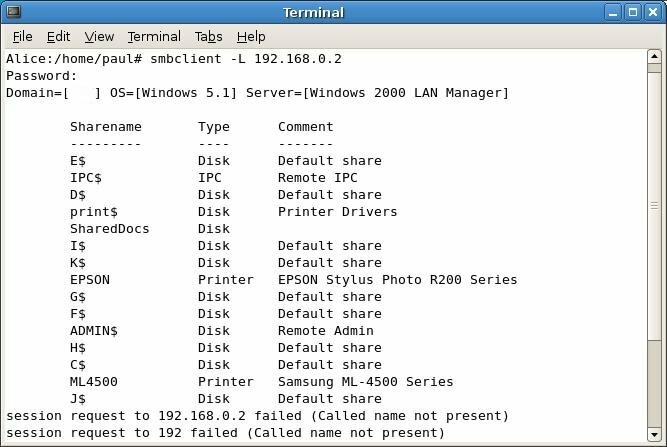 Clearly, you would use your own workgroup name, computer name and printer name in the path. Once (if necessary) this has been done, click Continue and you will get the Make/Manufacturer for any page. This is where you select your computer manufacturer and then click Continue. Now you will see a pop up box that asks for your password. Without that, you cannot continue beyond this point. YES! It’s time to celebrate. At last, you’ve reached the page that gives you the drivers. Scroll down until you find the Epson Stylus Photo R200 (I promise you it’s there) and highlight it; click Continue. Success! 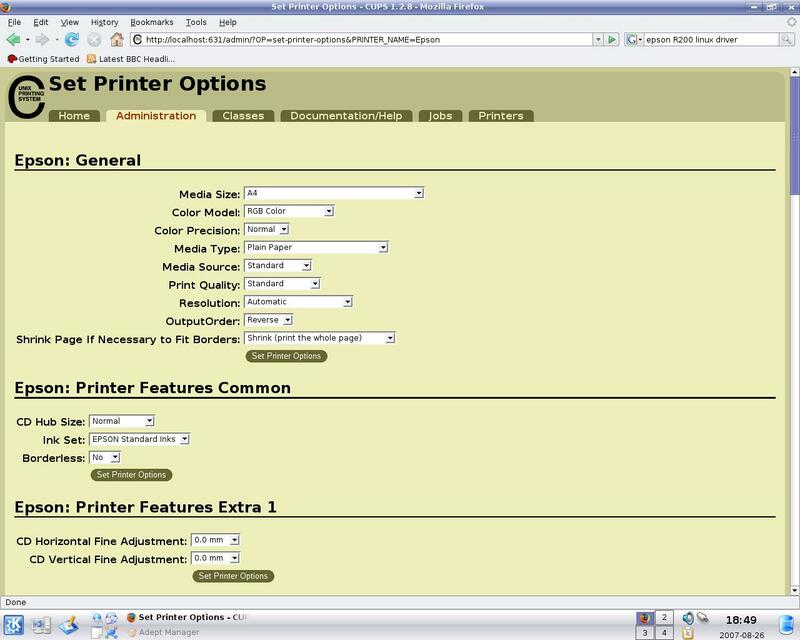 Here’s the page that says its all installed and you should be able to use your printer. It’s also where you can make minor adjustments to things such as border sizes, paper sizes or type and so on. At this point, if you click on the Printers tab, you can use a button to Print Test Page and make sure all is well. Alternatively, see the paragraph below. You can also go to to K, System Settings and click on Printers. 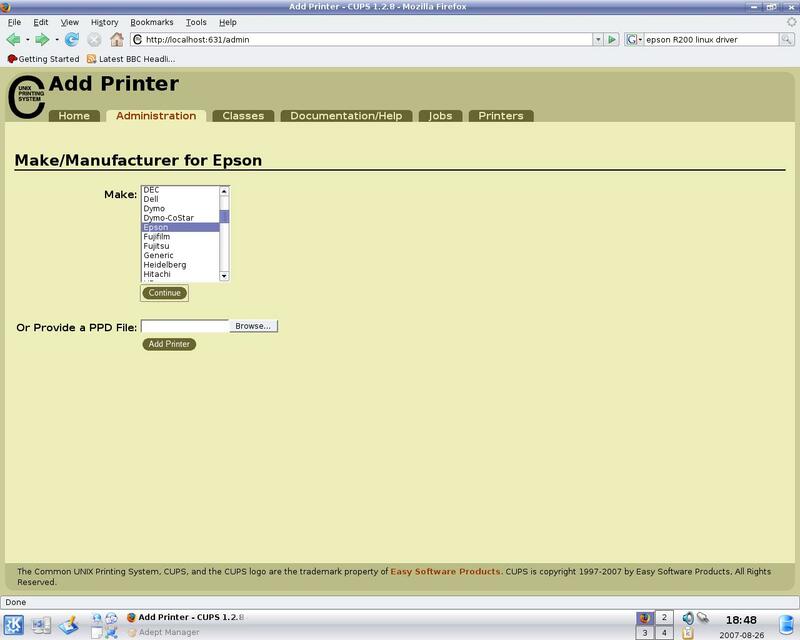 You will find your new printer listed and if you right click it, you can select from the drop down menu; Test Printer. This will send a test page to your printer and confirm your printer is working properly. Debian, being more of a “purist” distro, does not natively support printing to Windows based printers. 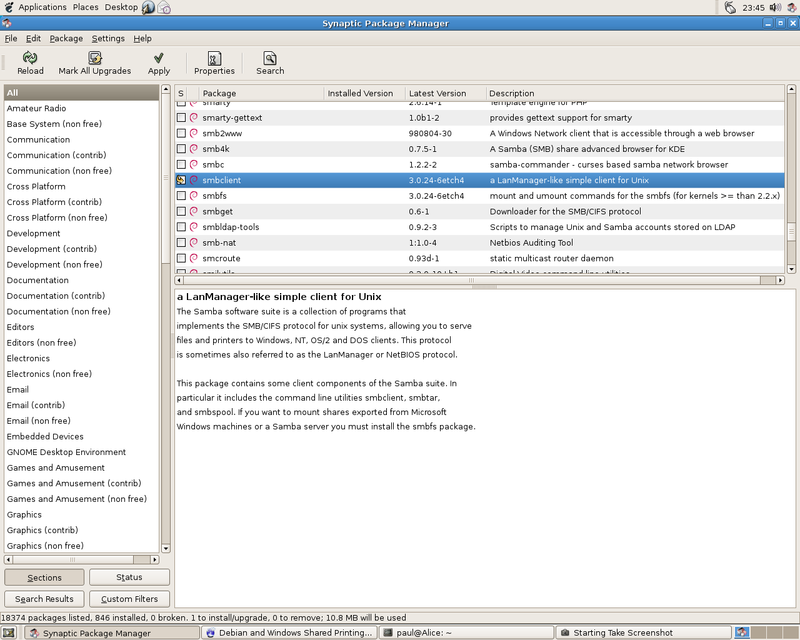 Therefore, you need to make some modifications to the system to enable Debian to talk to Windows! Carry out the following FIRST and then go back to Part 2, to complete the printer configuration. Synaptic works very similar to Adept (described in Part1). 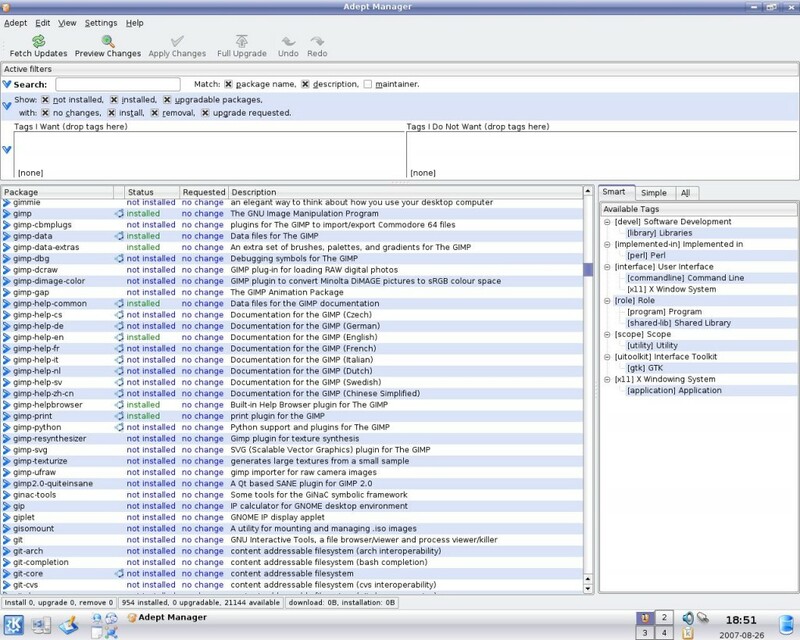 To install the components, Right click the required package and Left click, Mark for installation. When you have selected each package, click on Apply at the top of the page and let Synaptic work its magic. The above installation, will provide the option in CUPS to connect to a Windows printer. Please return now to Part 2 to complete your printer installation. I’ve added this section, as recently it was necessary for me to change my Windows computer to one based on XP Professional. This actually proved to be a stumbling block, as my formally trouble free Samsung Laser printer, consistently failed to communicate via samba. This suggested my Debian computer wasn’t “talking” to Windows and so an investigation ensued. (where [IP address] will be the IP address of your Windows computer). The important thing here is, under Comment, you should find the device you’re looking for and under Sharename, you can see what Windows has called it. Simply changing that one parameter in the Windows network path in CUPS, solved the problem.